You can’t measure what you don’t track. This is a simple enough statement that we all do in various degrees and aspects of our busy lives. We do it with work projects, with school assignments and even with our finances. So why not apply it to your weight loss strategy? 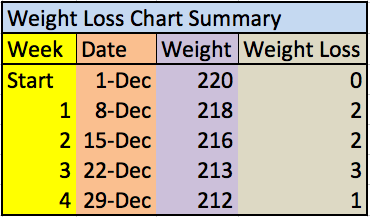 If you are looking for one easy way to improve your chances of meeting weight loss goals, it’s the ability to accurately track your progress. Here are a few helpful ways that you can begin to track or improve your tracking if you do some already. Constant awareness of your weight is important for long-term weight loss. It reinforces where you are on your journey and gives you motivation to get you where you want to go. Using a scale daily and tracking it daily is important to see your progress every day, then weekly and eventually monthly. It doesn’t have to be a fancy scale but it should be the same scale everyday and you should document the number everyday. Some of the pricier models come with body fat measures as well as BMI calculators that automatically sync up to a website. Use whatever works with your lifestyle and budget but use something constantly and consistently. Tracking your physical activity not only gives you a goal-oriented approach to exercise but more importantly, it shows you daily improvement. As you walk more, run more or lift more weights, you will inevitably get better at it and tracking gives you a visual snapshot of your progress. You can track by pen and paper or you can invest in many of the fitness devices available. The nice thing about the fitness technologies is that they usually can covert your efforts into calories and can be conveniently uploaded to a website with visual spreadsheets. 1) It is so easy to forget what you eat throughout the day and tracking it all out gives you a documented ledger that you can reference and begin to strategize about how to improve your eating habits. It gives you a better sense of what your body is taking in, what it doesn’t need to take in and gives you a visual document that holds you accountable to the calories you are consuming on a daily basis. 2) It makes you think about food in a very different way. Once you start tracking calories in food you’ll eventually be able to know how many calories are in your meals automatically and begin to make better choices of what you consume. You also will be able to better understand and decide if the amount of time at the gym is worth having a particular type of food. Is eating that piece of chocolate cake worth 2 hours at the gym? You’ll eventually find yourself consuming less calories and making healthier choices. Hopefully you are already tracking some of what you do and what you eat. Knowledge is power and the more you have the better you will be at making the most informed decision about your weight loss strategy and hopefully on your way to reaching your goals!